His clay-court prowess as unassailable as ever, Rafael Nadal won his record 10th French Open title by dominating 2015 champion Stan Wawrinka 6-2, 6-3, 6-1 in the final Sunday. The 31-year-old Nadal was overwhelmingly good from start to finish against Wawrinka — and over the past two weeks en route to La Decima, Spanish for "10th." Not only did Nadal win every set he played in the tournament, he dropped a total of only 35 games, the second fewest by any man on the way to any title at a Grand Slam tournament in the Open era with all matches being best-of-five-sets. Along with improving to 10-0 in finals at Roland Garros, Nadal increased his career haul to 15 Grand Slam trophies, breaking a tie with Pete Sampras for second place in the history of men's tennis, behind only rival Roger Federer's 18. It marked a stirring return to the top for Nadal at his preferred event and on his preferred surface: Over his career, he is 79-2 at the French Open and 102-2 in all best-of-five-set matches on clay. "I play my best at all events, but the feeling here is impossible to describe. It's impossible to compare it to another place," Nadal said. "The nerves, the adrenaline, I feel on the court are impossible to compare to another feeling. This is the most important event in my career." A year ago in Paris, Nadal surprisingly withdrew before the third round because of a wrist injury, making the announcement at a news conference while wearing a blue brace on his left arm and a look of resignation of his face. He couldn't bring himself to watch much of the rest of the 2016 French Open, he said, other than some doubles matches involving a good pal, and the singles final. Finally back to full strength in the off-season, Nadal returned to work, reconstructing his forehand and redoubling his efforts to get back to his best. Well, he sure proved to be precisely that Sunday, when the conditions were exactly to the liking of a guy who grew up on the island of Mallorca. The sun was shining, there was barely a trace of cloud in the bright blue sky and the temperature was about 85 degrees. Wawrinka is no slouch; he owns three major titles, including one from Roland Garros, and had never lost a Grand Slam final. But a five-set semifinal win Friday over No. 1-ranked Andy Murray must have taken something out of the 32-year-old from Switzerland, the oldest French Open finalist since 1973. His shots didn't have their usual verve, his legs their usual spring. 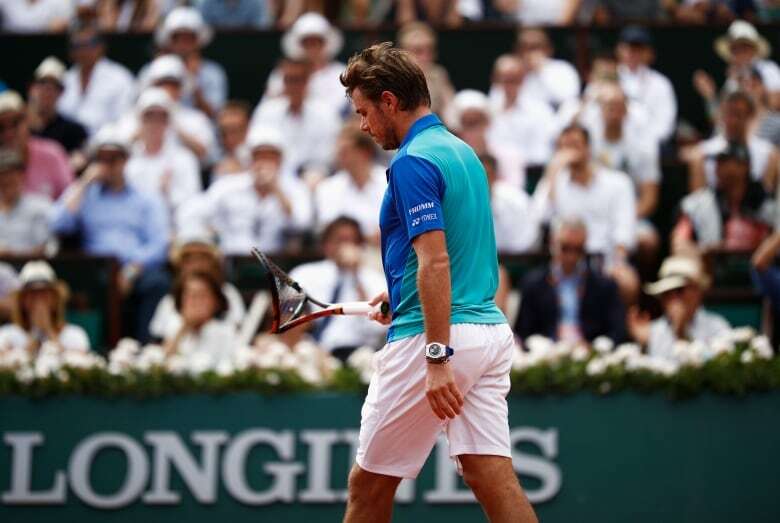 After one point Sunday, Wawrinka bent over, leaning one arm on his racket and resting the other on a knee. When he netted a forehand to close a 14-stroke back-and-forth in the second set, he pounded his strings on his head several times. Later, he spiked his racket, then mangled it by breaking it over his knee, drawing a warning from the chair umpire. Nadal has that way of wearing down opponents, physically and mentally. On this day, he was terrific. He won all 12 service games, made a mere 12 unforced errors, and won 94 total points to Wawrinka's 57. When it ended, Nadal dropped to his back on the clay, then rose and briefly pulled his blue shirt over his face. He was again the champion, again unbeatable at the French Open. Nadal is no longer the 19-year-old he was when he won his first French Open title in his tournament debut in 2005, wearing long white pirate shorts, his flowing locks wrapped by a white headband, his sleeveless shirt revealing bulging biceps. The shorts are shorter, the hair more closely cropped, the shirt has sleeves. But his game? Somehow, better. Nadal also won Roland Garros in 2006, 2007 and 2008, then after a fourth-round loss on bad knees in 2009, he grabbed a record five in a row from 2010-14. A quarterfinal loss in 2015 ended that run, then came last year's injury. His return to a final in Paris was a meeting of two of the most respected shots in the men's game: Nadal's spin-heavy, high-bouncing uppercut of a forehand vs. Wawrinka's one-handed, power-packed backhand, delivered with such force that the thud of racket-meets-ball sounds like a leather-bound encyclopedia volume — remember those? — being dropped on a wood desk. So Nadal stayed away from that side early, going instead after Wawrinka's forehand. It worked: Of the first seven points won by Nadal, six ended with missed forehands by Wawrinka. 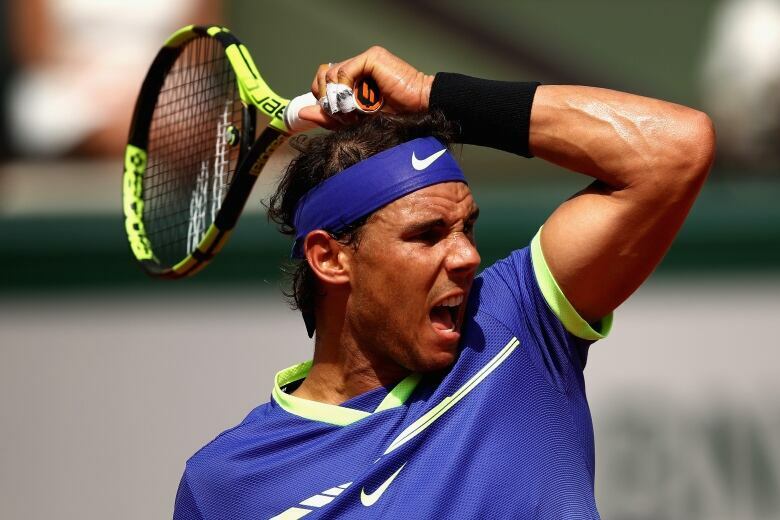 One area of significant improvement for Nadal over the years is his serve. Once passable, it is now potent. So when confronted with the first break point for either man, 10 minutes in, he solved the predicament this way: service winner at 173 kph, ace at 189 kph, service winner at 194 kph. Wawrinka would never see another break chance. When the ball was in play, Nadal barely missed at all. His groundstrokes were delivered with loud, long grunts, echoing in the otherwise mostly silent Court Philippe Chatrier, filled with 15,000 or so souls too rapt to speak. They let out a burst of claps and roars in the second set on one particularly exquisite display: Wawrinka smacked a cross-court backhand to a corner, and Nadal sprinted to his left to get to the ball, wide of the doubles alley, and whip a forehand that curved around the net post and landed near a line for a winner.